German government plans to spy on terror suspects by deploying malicious e-mails have drawn sharp criticism. The e-mails would contain Trojans - software that secretly installs itself on suspects' computers, allowing agents to search the hard drives. 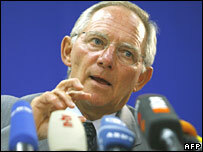 German Interior Minister Wolfgang Schaeuble is quoted as saying the spyware would be used only in a few cases and for a limited time. The measure would form part of a new anti-terrorism bill. A spokeswoman for the opposition Free Democrats, Gisela Piltz, called the proposal a totally unacceptable intrusion into privacy. But a spokesman for Chancellor Angela Merkel said she supported the measure. According to German media reports, the malicious e-mails could appear to come from different official bodies. Justice Minister Brigitte Zypries, of the Social Democrats (SPD), has voiced concern about the spyware plans, saying they might infringe privacy laws, the Deutsche Welle news website reports.